At Russell & Sons Waterproofing, call us first or for a second opinion! We are family owned and operated out of Peterborough. We have over 40 years’ experience in the waterproofing business. We service wet basements by excavating the outside walls, power washing the surface, then repairing all cracks or holes with hydraulic concrete. Then we apply two coats of liquid seamless rubber. We then install a delta membrane system. Lastly, we put a big O weeping tile to the existing drainage or a new sump pump to finish the job. We service wet or leaky basements to prevent condensation & mould. 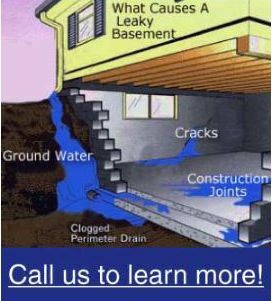 We also install sump pumps to direct the surrounding water away from your house, and do crack repairs to foundations to help stabilize the structure. Our goal is to provide you with a job well done and 100% customer satisfaction. You can expect knowledge and expertise from us along with Year Round service. Seniors’ discount available!